The Ford Focus ST is the first front-wheel drive car I would actually purchase with my own cash. I don't lust after it, or fall asleep thinking about it, it's just a really good car. And certainly way better than I expected from a four-door, front-wheel drive hatch. Is there one part that makes this car awesome? Not really, but when you start adding them together you get a pretty amazing car for $25k. And it's not just a value proposition. The car is fun to drive. There is nothing better than torque. It's that smile that comes over your face as you downshift and jam the gas pedal thru the floorboard while waiting for redline. In the ST, it's called overboost. 270 ft lbs of torque for 12 seconds which means you've only used half of it when you reach 60mph in 6.4 seconds (according to Ford). I like that, too. The things I didn't care for when I first drove the car slowly started to grow on me. The electronic torque steer compensation is the best example of this. The car senses torque steer and feeds power into the rack turning it the other way to offset the pulling of the wheel. It's way more complicated than that but you get the idea. At first I was fighting it a little. I could see the slope of the road and knew full throttle would pull me down there and I compensated. But so did the computer so I ended up overcompensating. This drove me nuts at first. But by the end I was driving really fast grabbing gears and releasing the clutch at full throttle with just one hand on the wheel because I knew it wouldn't get yanked away from me. The purists can complain about the electronic aids. I did, too. Then I drove another turbo front-wheel drive car the next day and was super annoyed by the torque steer. My only hesitation with the ST is that the car I drove was still pre-production. I found thick aluminum cooling pads stuck to the intake charge tube and the front fascia bumper cover is being redesigned to eliminate the giant gap at the hood. But if the car I drove is any indication of the car you are buying at the dealer you will be very happy. It looks like a Focus to me. Sure they offer cool colors like Tangerine Scream, and the bumper cover/grill opening is about to devour the road, but it's still just a four-door hatch. The 18" wheels look great and for the first time ever, the car will be sold with the same tires worldwide which is cool... but it's a Focus hatch. Is that a bad thing? Not really, but it's nothing special, either. The only thing you need to know here is the ST has the best car seats I've ever sat in. Made by Recaro of course. I love the front leg slide out, but the shoulder pockets are incredible. Your back is supported but your shoulders are free to turn the wheels. And there are two more Recaros in the back seat! If you are near a Ford dealer, stop in and try them. I've seen nicer looking seats but they never live up to their looks. The steering wheel is actually nice to hold. Most cars I get in these days are more like a dashboard then a steering device. The leather was ridiculously nice and the grip points near perfect. My only complaint is the way the dash ends at the door opening. I kept banging my knee on it getting in and out but I was tired after flying all the way over for a day of driving. I'm sure you'll be fine. The car is fast for its class but not really "sports car" fast. Part of the problem is simply perception. The 0-60 times are 6.4 seconds but the engine pulls so smoothly you don't realize how fast your are spinning the speedometer. It doesn't feel like a turbo motor. Everyone always talks about lag — the pause or delay after you press the gas before the power kicks in. I never really felt lag in the ST. Sure, you lose overboost after 12 or so seconds, but 12 seconds of acceleration causes a fair amount of concern in this car. It makes 270 ft lbs of torque and it pulls nicely to redline. My hunch on turbo responsiveness is due to the cylinder head design. The exhaust collector is effectively inside the cylinder head suspended in a jacket of water. From there, only one pipe leaves the head and travels 5-6 inches directly into the turbo which was specially designed with Borg Warner for this application. My only complaint on the engine has to do with the curiously weak bushings. It sounds great to hear the engine clank with a hard shift but it can't be good for the car. The car features pretty normal brakes just slightly oversized. They felt strong and confident as they should and the car braked amazingly well, but there is none of the four-piston this, monoblock that. They are just good brakes. And in fairness I think most of what I loved about the braking was a result of excellent suspension tuning anyway. It was ok, I guess? I don't really know because I spent the entire time downshifting and accelerating through corner after corner glued into the Recaro seats. I thought the ride was near perfect. But I've always fitted stiffer shocks and suspension to my cars so what do I know? I know my mom could drive this car for weeks and never mention any harshness so the ride is good. The handling is unbelievable. I drove the car harder and harder and never really got close to the car's limit. Sure, I hammered some roundabouts and jumped a curb or two putting a wheel in the air while I was at full throttle but that's sort of cheating. I drove the car almost exclusively in Sport mode. I fully disabled it a few times but I actually like the car's feel better with it turned on. I could turn in crisper and smoother with the back end feeling planted. With it off, the car felt a little slower to turn in and the rear felt a little lighter. Its unfortunate, but the computers are starting to get better then the drivers. I can't brake just one caliper to help the car rotate. But the computer can, and it does and the thing turns! Ford calls it Torque Vectoring Control, or TVC. As much as it's not cool to like driver aids these days, I really enjoyed it. It felt natural. The shocks on the ST were perfect for me. The valving was awesome. I usually jack up the rear rebound dampening as much as possible. I hate that feeling when you jump off the gas too quickly or squeeze the brake too fast and the rear of the car pops up into the air. I never ever had that happen once with the ST. I could jam into the corners hard on the brakes and not feel the like the back of the car was getting light on the suspension. And the car never ever pushed back on you. When you set the car into the corner, it would stay there till you shifted the weight elsewhere. Most cars I drive have a bouncy effect where you turn in and the springs overpower the shocks and force the weight back even again. 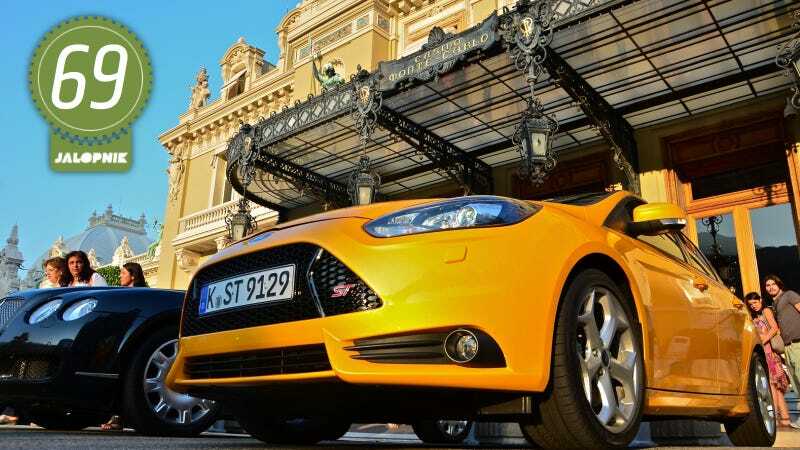 Not with the Focus ST, it takes a set and holds it which makes the car incredibly confidence inspiring. This is one of the more solid front wheel drive gearbox's I've played with but the throws were a little long for a car with this much sport. Clutch was soft and light. Nothing really special here. Sure it's a six-speed, but what performance hatch comes without one these days? We had the euro version of the car so no touchscreen or large display, but the sound was designed by Sony. It sounds ok, but the engine sounds better. The car has one of those trumpets to direct sweet engine sounds to the cabin. I normally don't care for these systems and smirked when I heard about it but the one the ST works nicely. The sound is subtle, not loud. Just enough to feel good, enough to make you squeeze the throttle a little more than you should. The Focus ST comes with awesome toys. Only you will never get them because you live in the U.S. The car would self correct and maintain is position in its lane on the highway! Like Knight Rider. And once when the tollbooth thing stuck to the windshield didn't trigger immediately, the auto brakes sensed the impending crash with gate and knew we were approaching the point of no return. So the Focus JAMMED the brakes and we stopped! It was so awesome! But you will get none of this Knight Rider awesomeness. But you should be happy anyway because the little ST is fun to drive. The car itself is the toy. I really like the ST. I'm more of a rear-wheel drive, sports car kind of guy, but at some point those days will change and I'll need a car with four doors for a family or something. When that happens this is my first choice outside of the obvious more expensive luxury cars in this class. Why? 270 lb-ft of torque, four doors, Recaro seats, and really well tuned suspension. The torque steer correction, 18" wheels with sticky tires, and Torque Vector Control just make the car feel way better than it should for $25K base. Go test drive one and see what you think. They should start showing up later this summer.